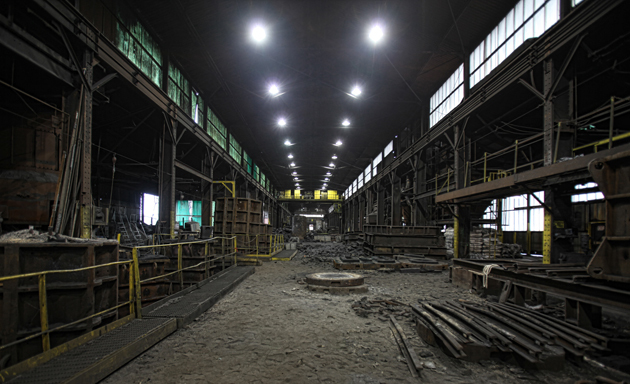 One hundred thousand square foot foundry situated north of Wheeling, West Virginia. The foundry is equipped with a 100% no-bake sand system supported by two continuous sand mixers, and three molding pits. We use a sand reclamation system which allows us to reprocess our sand and condition it to ensure optimal performance. We have two operational Ajax channel induction furnaces of 55 tons capacity, each accompanied by three separate casting pits, all at different depths. Our largest casting pit is capable of pouring an ingot mold up to 200 inches in height. Our facility allows us to produce in excess of 100 tons per day. Pattern shop, spectrometer and modern laboratory facilities are on hand to ensure consistency. While ingot molds, stools, and bottom pour equipment is the basic shop load, Centre Foundry has long been the leader in producing chill pans, chill bases, slag pots, slag runners, and other casting for the steel and Ferro-alloy producers in the United States, Canada, Europe, and Australia. We are able to produce all castings up to 55 net tons, 200 inches in height, slag pots that range from 5 to 330 cubic feet, and no restrictions on sprue plates other than weight.